Mobile Notary Services are available to individuals and businesses located in the Virginia, D.C., and Maryland area. With a scheduled appointment you are assured that your documents will be accurately notarized at the time and place of your convenience; whether it be at a law office, assisted living community, hospital or medical office, your own residence or other convenient location. Why Hire a Mobile Notary Public? Expertise: DMV Notary Mobile is a highly trained notary public and is certified by the National Notary Association (NNA). We will ensure that your important documents will not be rejected due to notary public errors and omissions. We are compliant with all Virginia notary public laws. Banks and other company’s may not notarize certain documents due to liability. We hold an Errors & Omissions insurance policy in the amount of $25,000. We will travel to you at a time and place that is convenient for you. What’s required before we notarize a document. Personally known, which means the Notary Public has an established relationship with the individual (regular interaction over a period of time giving the notary a deep-seated belief that the person is who they say they are). Convenient appointments can be scheduled and last minute calls are always welcome. 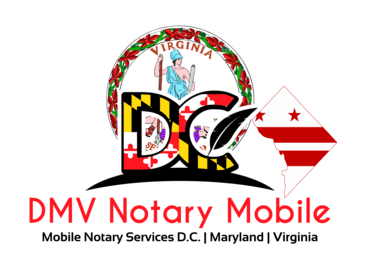 If you are seeking high quality, reliable mobile notary services, please call DMV Notary Mobile at (202) 826-8179 or click here for a quote!